Today's post is a bit unfortunate! I wore this polish yesterday and swatched it then, when it was dull and slightly rainy, and now it's so sunny! Normally I swatch my polishes a few hours before I post, but I did two in one day yesterday because I had too much time on my hands! Anyway, this polish looks lovely no matter what the weather is like! 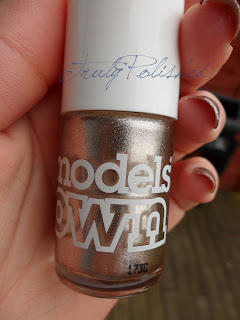 It's from Models Own, which are probably my favourite nail polish brand. Their polishes all retail at £5 and they usually have a buy 3 save £3, buy 5 save £7 deal, so it's always worth buying a few! The shade is called Champagne, and it's a foil effect polish. The colour is really hard to explain, it's a silvery gold/goldy silver! It matches with everything. I'm one of those people who can't wear a bag with silver bits on if I have gold bits on my shoes, no matter how small, so I really love this in-between shade! The formula in this is my favourite kind, fluid, not thick, and really heavily pigmented. 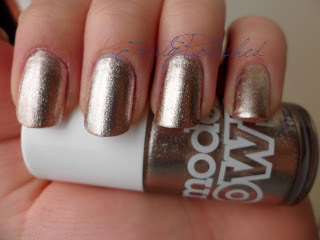 I've worn this polish 10+ times and because I know the formula inside out, this is easily a one coater for me! 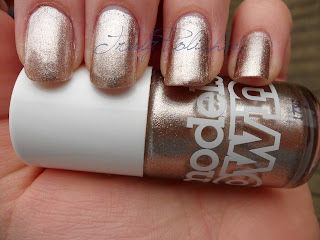 In the photos below I'm wearing one coat of Champagne with a coat of Seche Vite. This polish is so pretty! It can be found in Boots, online at ASOS.com, or on the Model's Own website here where it retails for £5. Models Own is probably my favourite brand of nail polish! I own so many of them. I have golden green, green black, pinky red, purple blue, and Indian ocean from the Beetlejuice collection and I love them, can't fault the formula! champagne has an amazing formula and they have a glass fleck called Mystic Mauve that is definitely worth buying!